Scrapbook of the lawyer Sir William Charles Croker ('the Sherlock Holmes of the insurance world'), containing caricatures and memoranda by him, photographs, newspaper and magazine cuttings, seating plans, invitations and other ephemera. Beginning with newspaper cuttings anouncing Crocker's knighthood in 1955, and ending in 1956. A few items from 1955 to 1964 loosely inserted. Crocker made his name in the 1930s investigating and prosecuting insurance fraud (and in particular the activities of the Leopold Harris arson gang, convicted mainly through his efforts in 1933). In 2000 it emerged that at the outbreak of the Second World War he served as Deputy Director of MI5, despite being a 'Nazi sympathiser opposed to war with Hitler [...] active in Truth, a journal openly supportive of Sir Oswald Mosley' (Independent, 30 July 2000). The folio scrapbook and its contents are lightly aged and in good condition. 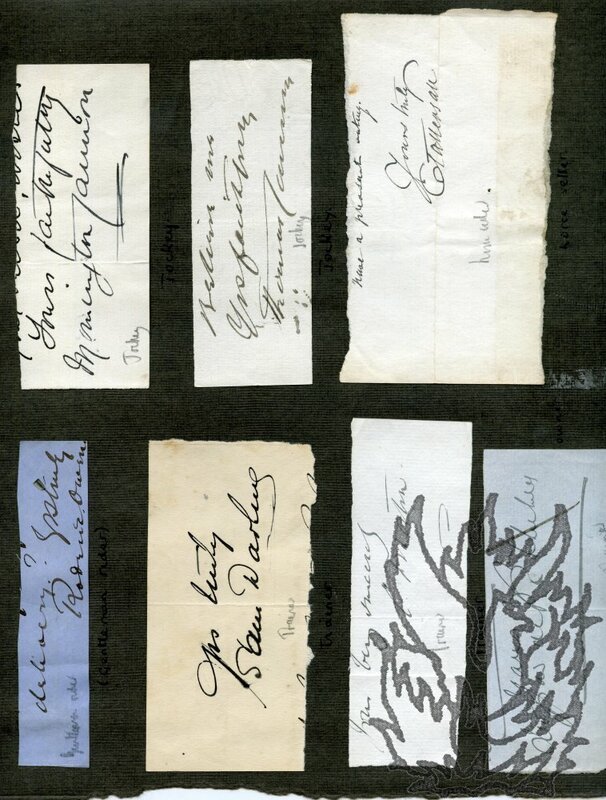 Part of an Autograph Letter, Third Person, to Richard Dighton, artist. Place and date not present. Two pages, 12mo, one stain, fold marks, sl. grubby, text clear, as follows: The Prince of Wales has at the same time desired Sir W. Knollys to tell My Dighton that H.R.H. thinks the likeness of the King of the Belgians would be much improved if he could make the nose a little longer and the beard a little darker -- The portrait shall therefore remain in Sir W. Knollys's room should nr Dighton wish to take it away with the view of making the improvements which the Prince has suggested. A list of names in pencil (Dighton's hand) has been added, including Thomas Baring and Combermere. 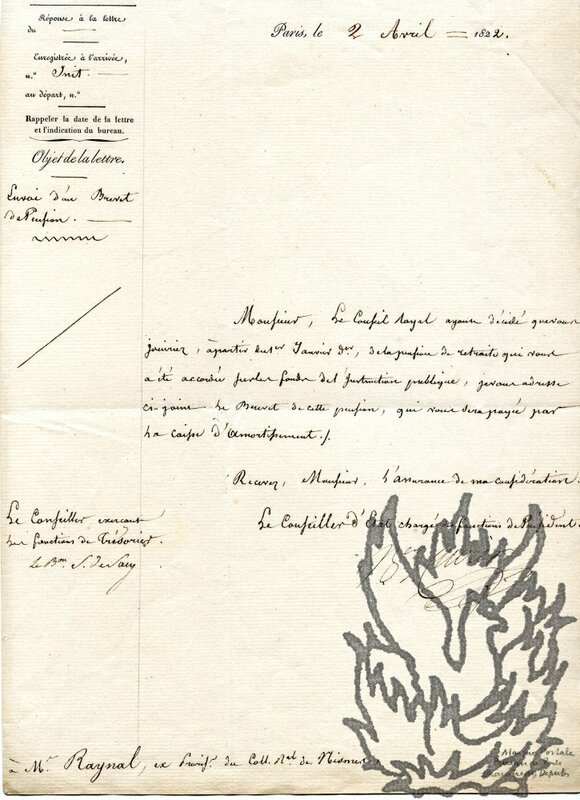 Letter, in a secretarial hand, signed by Cuvier ('Bn G Cuvier'), to 'Mr. Raynal, Proviseur du college Royal de Nismes'. With engraved portrait of Cuvier by T. Richomme, from a drawing by 'Mme Lizinka de Mirbel'. 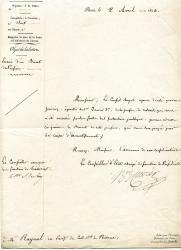 Letter of 2 April 1822; on letterhead of the Conseil royal de l'Instruction publique. Engraving undated (circa 1840?). Letter: Folio (30.5 x 20 cm), 1 p. Bifolium, with text on recto of first leaf and address (with several postmarks) on reverse of second. Five lines. Text clear and complete, with good clear signature. 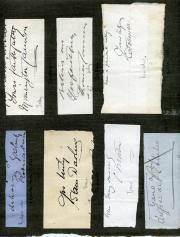 Fair, on aged and lightly-creased paper, with 1.5 cm closed tear in top left-hand corner (not affecting text). The 'Objet de la lettre' is given as 'Envoi d'un Brevet de Pension'. The pension will be paid 'par la Caisse d'Amortissement'. Engraving: Original, on paper 24 x 15.5 cm. Captioned 'G. CUVIER.' 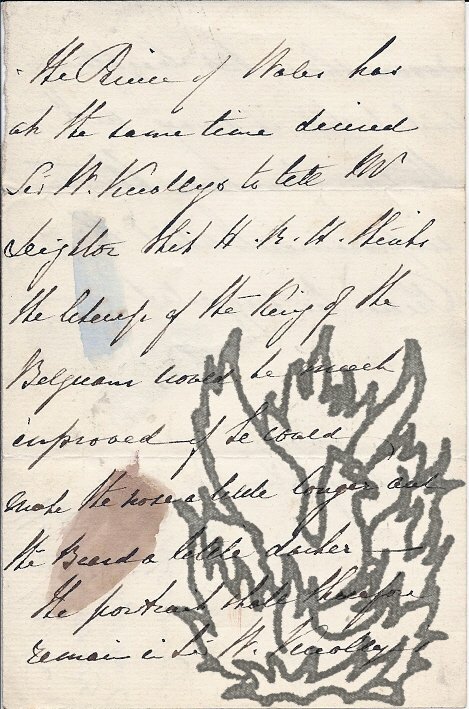 A good clear impression on grubby, spotted and lightly-creased paper. 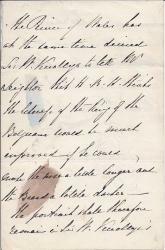 Autograph letter signed to Donald Currie, shipowner. Groom in Waiting and Equerry to Queen Victoria (d.1897). Gardiner says that Currie's arrangments for the King of the Belgians cannot be bettered. He will order the carriages for 11 and meet at Westminster Bridge. Currie has added a list of names, English and Belgian, presumably of people involved in the visit.